A Trailblazer in Mobility Support and Independence When it comes to the world of superior wheeled mobility, nothing can beat Drive Medicals leading edge and very popular, sturdy yet Lightweight Transport Wheelchair. This all-purpose wheelchair will empower you like nothing else, as it meets and exceeds your mobile needs and expectations.As a maintenance free Lightweight Transport Wheelchair, this personal transport aid arrives at your door ready to roll. Developed with your comfort, safety and ease of use squarely in mind, its a durable mobility assistant suited to the unique requirements of men and women, as well as younger users of all ages.In addition to the unbeatable comfort and long-lasting design, it can be folded up in a jiffy and its ultra-lightweight frame makes it easy to move it in and out of any vehicle in no time flat. 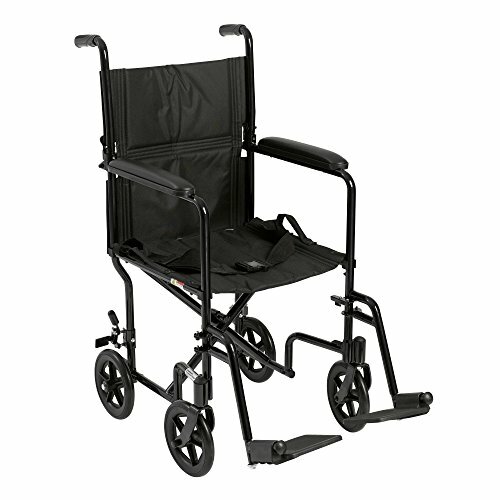 Due to its sturdy, yet lightweight frame and easy maneuverability, your caregiver will also be singing its praises in no time flat. Go ahead...Experience the Drive Difference Now! The seat dimensions are as follows: Width: 18.5", Depth: 15.75".